The Eurostars Lex (fira hotel Barcelona) is a newly opened hotel: everything is new and quality-built. The rooms are sound-proofed for guests to enjoy maximum peace and quiet. The eye-opening, striking details are ever-present in the establishment’s different ambiances (business hotel Barcelona): desks illuminated in lilac, fuchsia armchairs, pistachio-coloured furniture…The hotel Lex (Hospitalet de Llobregat hotel fira Barcelona) has a small gym and a lobby bar which serves a very complete buffet breakfast, with cured meats and sausages, assortment of cheeses and a wide range of diet foods. The lobby bar also provides room service, offering a menu card with set dishes, salads, pizzas, hot and cold sandwiches, in addition to an extensive selection of wines, sparkling cavas and cocktails. The Eurostars lex and its staff have gained a lot of experience with arranging meetings, conferences, trainings and all sorts of events. Offering conference facilities including 3 meeting rooms the hotel has been used as a conference hotel in Hospitalet de Llobregat on a regular basis. 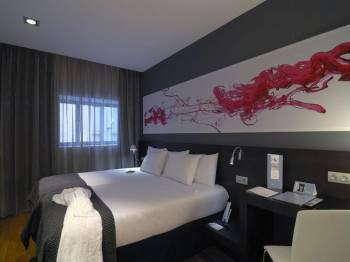 Please also have a look at the other conference hotels in Hospitalet de Llobregat.